Android has been the most used and popular smartphone operating system for the last few years and its market share is still growing. 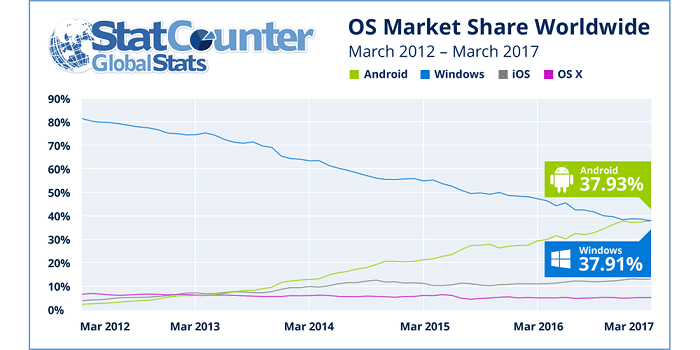 Recently, according to the StatCounter’s latest report, which tracked the combined share of operating systems across desktop, laptop, tablet and smartphone, Windows currently stands at 37.91% and with a very small lead, Android is at 37.93%. Regarding this, the CEO of StatCounter, Aodhan Cullen said, “This is a milestone in technology history and the end of an era.” This denotes how Windows’ leadership in operating systems worldwide is declining. Windows held the largest share in operating systems used worldwide from 1980. However, it also shows how Android has emerged as a leader which had only 2.4% share of operating systems just 5 years back. Nevertheless, the statistics is not 100% correct. While calculating, it took into account, only the devices connected to internet. Still a huge number of Windows PCs, used for particular functions in different companies are not connected to internet. Windows is still the most used operating system in PCs with 84% market share. The reports mentioned that Windows is still in the lead in regions such as Europe and North America. But Android has successfully gained the lead in Asian countries where technology is still an emerging sector. Besides, another important factor behind the lead is the increase of Chromebook usage by students for educational purpose. Failure of Microsoft to establish itself as a nice and user-friendly operating system in mobiles is also another reason behind the rise of Android. Though Android has taken the lead but it will be very difficult for Android to keep the lead as Microsoft is developing new technologies like AI (Artificial Intelligence), AR (Augmented Reality) and Continuum (a product that aims to replace a desktop and smartphone with a single Microsoft-powered phone) to shake the market.